Super Modern, Romantic and Cosy Two-Bedroom Apartment of Very Spacious 123sqm! WELCOME TO OUR ROMANTIC PARADISE! 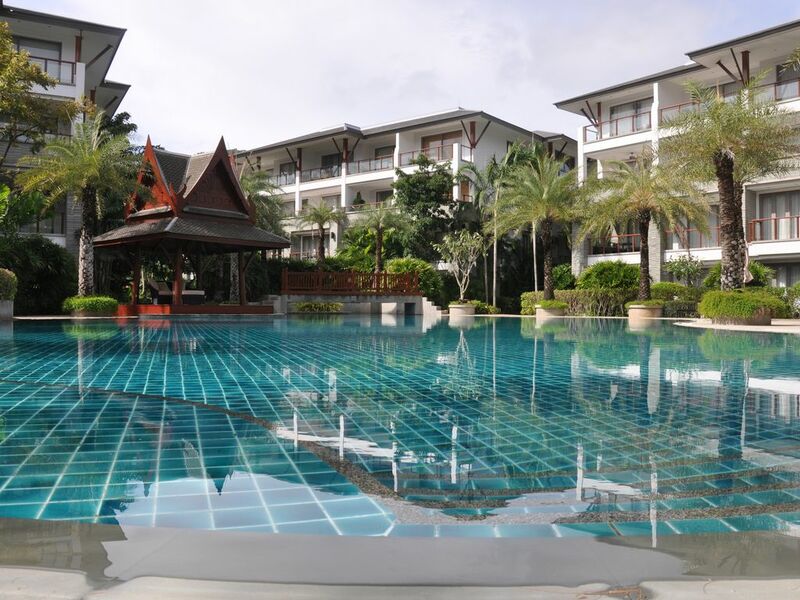 Located directly on Phukets most beautiful, tranquil beach our 123 sqm ground floor apartment will offer you 'THE PARADISE'. The Resort is called 'THE PEARL OF NAITHON' and it´s truly a jewel. Our unit has two bedrooms with 2 bathrooms, an open plan living area with a lovely kitchen, living & dining room. Master bedroom has en suite bathroom with separate shower and toilet area and a gorgeous bathtub. All in a luxurious modern design! Air-conditioning are of individual split type units and are noise free. From the lovely terrace you have direct access to the Resorts Saltwater Lagunapool with In-pool jacuzzi. There´s satellite TV, Reliable High speed Wireless Internet, CD/DVD player, and a speaker system with sound dock station for IPOD´s. As our guest you will have exclusive use of the 46 x 22 meter Huge lagoon style saltwater pool with in-pool Jacuzzi, a clubhouse with gym, lounge, reception, valet parking and a restaurant/Bar with ROOF TOP SEATING! A 'meet & Greet' on site by my Co-Ordinater May on arrival. Free access to Resorts Club House, Gym and Huge Lagoon Pool with in pool/Jacuzzi. 4 Private Beach chairs with beach towels. Laundry twice a week of both beach towels, bath towels and bath mats. Cleaning of apartment once a week. Laundry of bedlinnen once a week. And of course Free access to High Speed Wireless LAN in apartment & Resort. english, spanish, swedish, danish, norwegian, IF CONTACT VIA EMAIL - YOU CAN USE ANY LANGUAGE! I Love Thailand! When I fist visited Phuket 2007, I instantly fell in love with the island. It has everything! and all within a short drive. Before buying here I visited many condominiums throughout the island, but The Pearl Of Naithon won my heart. As I am a "Beach lover" - This was the place! I could just take my beach chair and walk to the beach in a minute or two, place myself and my chair at the water edge with my feet in the water..... And its calm..... Not busy of tourist and vendors.... Nice restaurants to enjoy Lunch.... Its a piece of PARADISE! The apartment in is a condominium, ground floor close to pool but far enough away so not too be bothered if pool gets too noisy.which it didn't. Area is lovely if you want to get away from it all.. everything you might need is right or front or within a few hundred metres. ATM, small mini mart, pharmacy, multiple restaurants, street stalls and massage places. No hassling from anyone. It's very laid back. Maybe not the place if you want wild night life but if you want to relax, this is it. Beach can get a little rough at times but then we used the pool. Apartment has absolute everything other than food or condiments, but mostly we ate out. Looking at all the past views they are accurate and absolutely right. Christina's unit was ideal location is perfect absolutely one of the best beaches in the area always Friendly Smiles ideal location to enjoy several weeks of relaxation. The staff working at Pearl are outstanding friendly and helpful. We were two couples staying in January for 1 week of golf and touring in Phuket. This property was a great location and easy to access many other areas. The villa is very clean and easy access to the pool and other resort amenities. Would definitely recommend this unit and look forward to returning. I highly recommend this apartment to everyone who is looking for a comfortable and quiet place to stay in Phuket. The apartment is very spacious, clean and well equipped. We enjoyed having breakfast on the beautiful veranda. Chiristina and May are very responsive. The apartment complex is very green and has a nice pool with jacuzzi. It's about 3 minutes walk to fantastic Nai Thon beach. There are many restaurants in the neighborhood. Neither the less I would recommend to rent a car. The complex provides free parking for residents. We will definitely come back . If You enjoy peace and quiet in Your Holiday, this is the place to be! The appartment is truly a Home away from home. Nice beds, big refridgerator, aircondition for every room. Not to mention the working Wi-Fi, enough speed to do internet sufring, but also for distant working. The kitchen was well equipped for our breakfast needs. The access to the big and nice pool is really easy from the back yard of the appartment. We spent most of our free time lounging by the pool. The beach is really nice. There were plenty of families but definately not at all crowded. There In November/beg December there weren't any services in the beach (the picture of the beachbar must be from the high season). There are several restaurants on the short street, but if You are looking for action, this is not Your destination. The street is pretty much dead latest By 11 in the evening. Perfect for us travelling with family. Our favourite restaurants wre the 24 close to the Pearl, the italian restaurant with really nice and friendly staff and the "german style" Beach Club. Special thanks also to May for her help during our stay. We returned home relaxed and ready to face the Christmas preparations! You don't need to look for an alternative at Naithon Beach! Christina´s 2 bedroom ground floor apartment in the Pearl of Naithon complex is ideal for 4 persons and is exactly as advertised. The pool is only steps away from your private garden with the beach being just across the road. There are many restaurants , food and fruit stalls lining this street. On arrival to the apartment you will find that Christina with May's help has left you a well thought out welcome pack with everything you initially require. Being a ground floor apartment our initial thoughts related topossible security issues, however this complex is extremely secure with 2 efficient security guards in attendance on a 24 hour basis . We hired a car to get the best of Phuket and you should be aware that although there are small shops within easy walking distance what you can buy in them is somewhat limited. We like Naithon Beach as it is much quieter than other parts of Phuket .This was our second stay there ,having spent 3 weeks in the Pullman Arcadia last year. We preferred the freedom offered by having an apartment. We would like to thank Christina and May for making our holiday a very pleasant experience and we hope to return next year if at all possible. Golf: GOLF MUST BE A TOTAL EXPERIENCE! The greens must be in good shape and the layout exciting on the course you are playing. Enough of challenging golf holes, so you don´t forget the course as - One among the others…..
ON PHUKET YOU WILL GET IT ALL!! You have 7 Golf courses on Phuket and all off them are in an excellent condition. Loch Palm, Red Mountain, Blue Canyon (2 courses), Laguna Golf Resort, Mission Hills and Phuket Golf & Country Club. My two favourites are Blue Canyon and Mission Hillls. Mission Hills (designed by Jack Nicklaus) nestled amongst a coastal mangrove forest and rubber plantations. said '17th is one of the best par 3 in the world. FROM THE APARTMENT, IT IS ONLY A 15 TO 40 MINUTES DRIVE TO THESE TWO GREAT EXPERIENCES! It is mandatory on all golf courses to rent a caddie (female) when you play. You pay the caddie about 200-300 Baht and It is normal to pay a tip of about the same amount. I wish you wonderful days of Golf, but don´t forget that the greens might be faster than you are used to. PER JOHANSSON, SWEDISH PGA-MEMBER SINCE 1988. PROFESSIONAL GOLF COACH SINCE 1988. GOLF COACH LJUNGHUSENS GOLF CLUB, SWEDEN.